Every year, students in the KPU Environmental Protection Technology program’s “Solid Waste Management” class complete a waste audit of the Langley campus. Waste audits involve the collection, analysis, and categorization of waste streams. The 11 students in the class conducted the audit on Oct. 19—a low-traffic day for KPU campuses. Before the audit, the university’s custodians were instructed to leave waste receptacles untouched until the class was finished their three-hour job. Dustin Venhuizen was assigned the role of project manager while the class amassed the data and compared it to other years’ audits. This process will be completed before the semester’s end. According to Emily Gutenberg, another student involved in the audit, the KPU community “sorts garbage well where appropriate bins are provided.” However, an area of concern that stood out to both her and Gutenberg was that single-use, disposable coffee cups were showing up in several different containers. Although the cups appear to be a mixed paper product or organic waste, most have a polyethylene coating on the inside to prevent leaking. This means that they don’t belong in any particular bin, despite the fact that they made up the greatest volume of waste in the audit. Last year, KPU used biodegradable, compostable coffee cups that cost students between five and 10 cents more per drink. These could go into organic waste bins, but when the Langley campus decided to switch coffee vendors in autumn, the campus started distributing cups that end up in landfills in large numbers. The cafeteria is also a site of waste mismanagement on campus. All waste in the cafeteria’s food preparation section goes straight into the general waste disposal, though Venhuizen and Gutenberg say that vast amounts of organic waste and recyclables could be collected there. While the audit showed that the Langley campus community is largely diligent in dealing with its waste, it did identify a few areas in need of improvement. 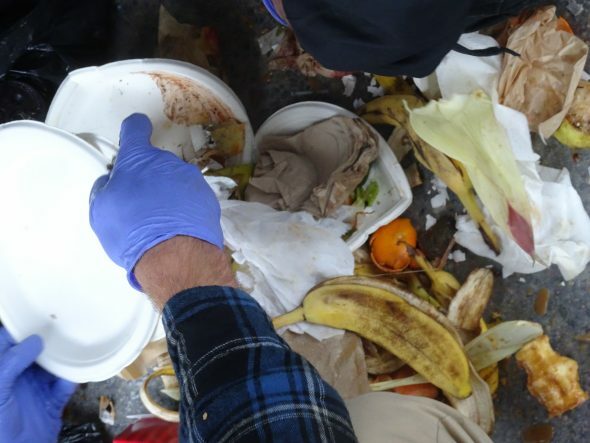 To tackle the issues of waste negligence on campus, the students recommend implementing more efficient waste sorting options within the cafeteria, as well as incentives to get students to use reusable cups, containers, and cutlery when purchasing food.